There is a special town meeting tonight in Rowe about plans moving forward regarding the school. I am going. I need to be surrounded by townspeople to understand how they are feeling about the whole thing. I will be living there soon enough so any decisions that are made will effect me. Change is always difficult for everyone, especially when it is sudden. The loss of the elementary school was a shock and a blow to the people of Rowe. The remains of the building are still there 7 months after the fire. Every time I drive by it I just wish it was gone. There is something to be said for it still being there though. It means that everyone has had time to go through their stages of grief if they needed to. The wound isn’t so raw. I think it has given us all more time to think about what the town needs as opposed to a knee jerk reaction to the loss. I think that is something we are seeing far too much of these days, that knee jerk reaction to our problems. There is no foresight. No one thinks about how anything is going to affect us 15 to 20 years down the line. You see it with gun control, energy policy, climate change. Events are reacted to rather than analyzed. Do something to fix it right now without thought about what that means in the future. Just look like you’re getting something done. I’d like to see thoughtful consideration given to what the town needs. Put the needs before the wants. Look at it from the perspective of 5, 10, 30 years from now. Rowe is the kind of place where properties are handed down for generations so forethought is needed. It’s easy to feel like you have lost all control due to the actions of others when it comes to the future of our kids, I know I do a lot of the time. I just hope because this town is truly run as a democracy that every issue is taken into consideration and everyone will feel a need to vote on their future. 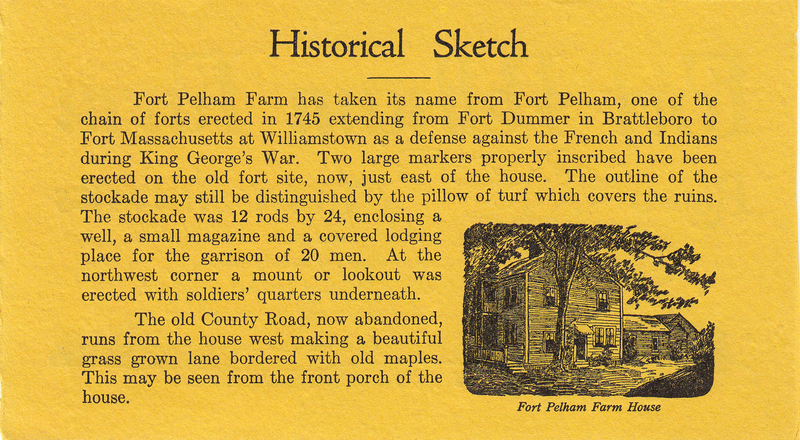 A common question asked is why is this known as Fort Pelham Farm? The original parcel of land (the entire town of Rowe) was originally sold by the General Court of the Commonwealth of Massachusetts to Cornelius Jones who later sold most of the land in 1779. The reference to the Wrights is where the name comes in. With the advent of better transportation the town of Rowe became somewhat of a vacation spot. It was advertised as a place of peace and tranquility. 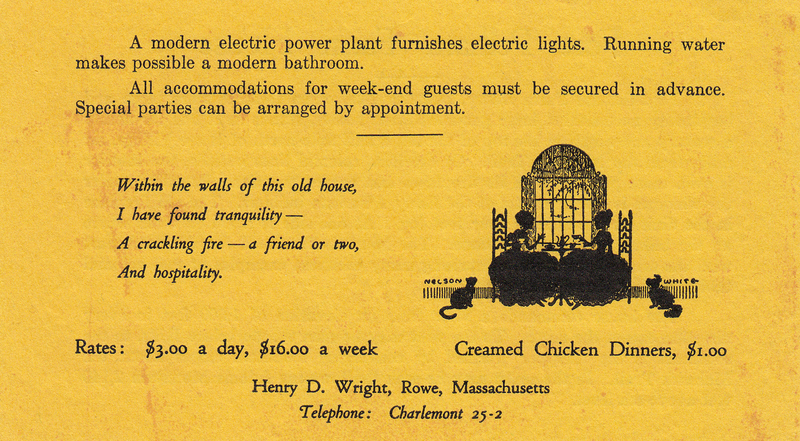 The brochure below was probably used in the early 1900’s. 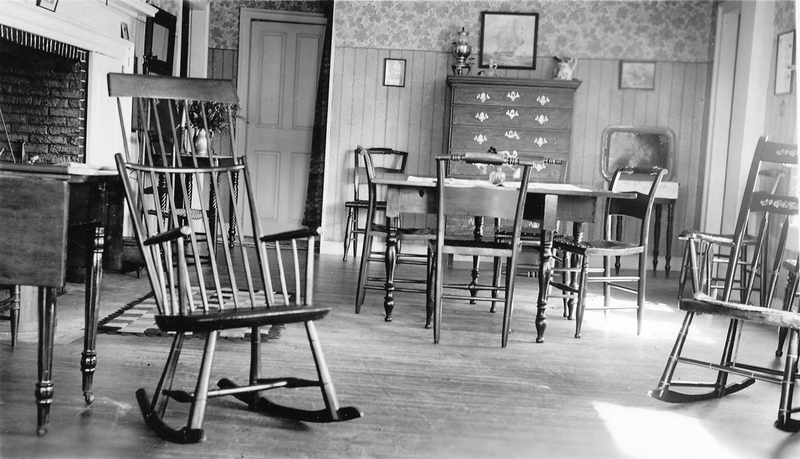 The dining room is the largest room in the house and remains very much the same as it was in 1900. Photos show how it was set up for their infamous chicken dinners. 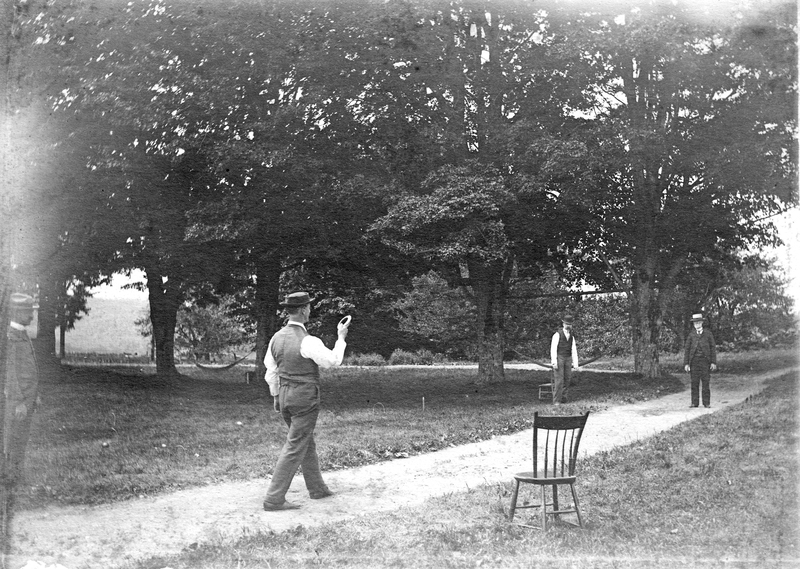 There are many photographs of people playing lawn sports on the property such as croquet. What I find most interesting is the household chairs in the driveway. 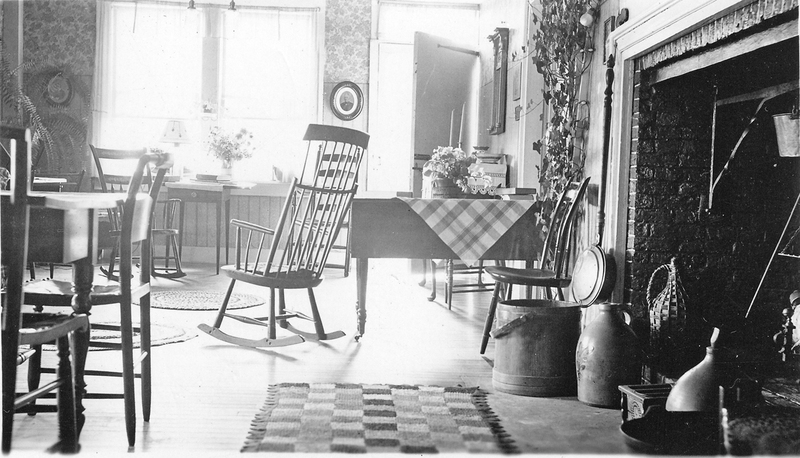 The Wrights took great pride in the history of their property. The family had owned it since Pardon Haynes built it and moved in. 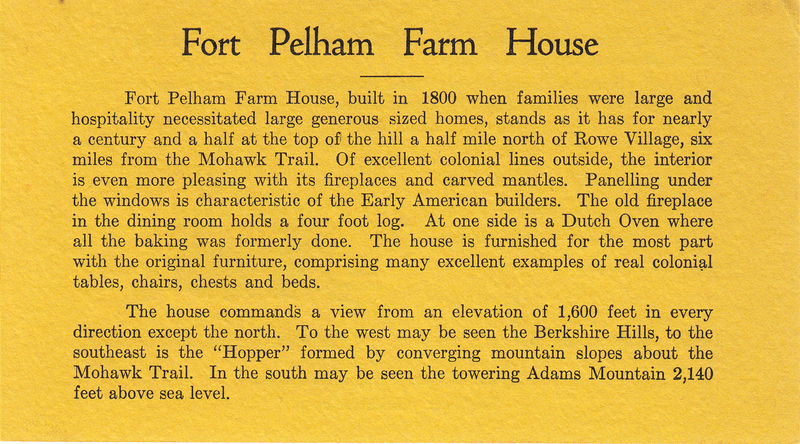 You have to wonder if the oral history of the fort was passed down for a number of generations, whether it was a sort of common knowledge within the family when they named it Fort Pelham Farm. 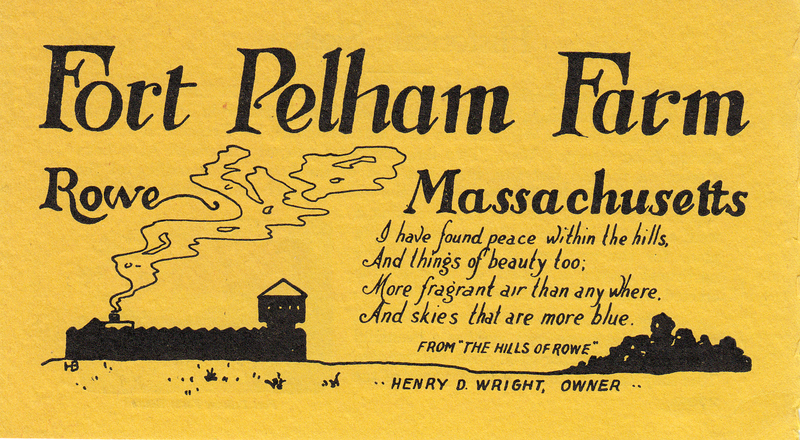 The name has stuck with the property and probably always will so rather than being known as the old Wright place or the Alix place it will continue to be known as Fort Pelham Farm. 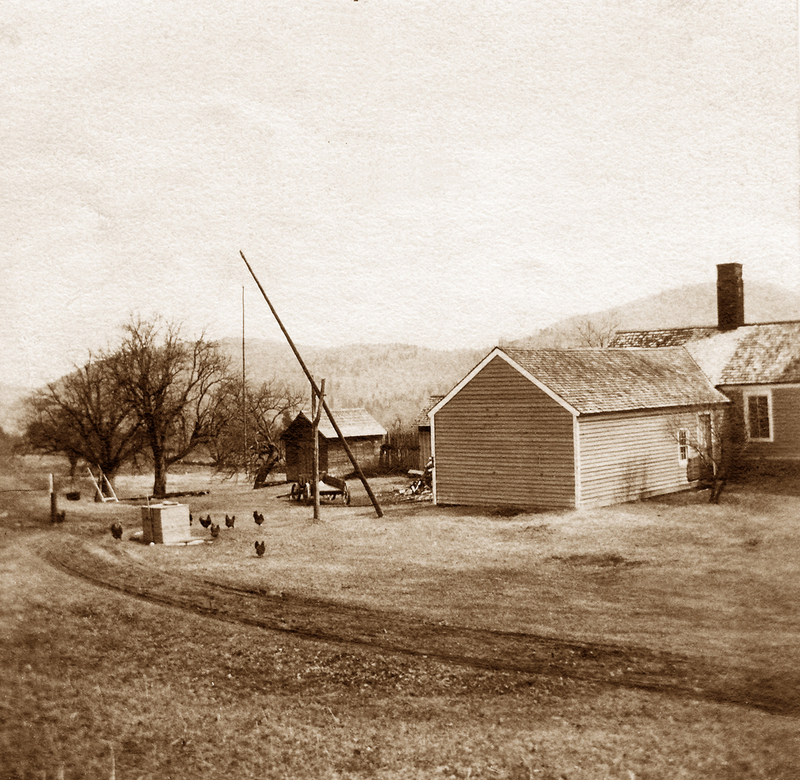 One of the projects that has been in the works for Fort Pelham Farm is a family history of the residents of the property. One of the most valuable records is the U.S. Census. I always hear people complain about having to fill out their census forms but they don’t realize what an amazing record they are leaving behind. The 1790 census for the town of Rowe shows that Dr. Pardon Haynes was living in Rowe with an adult female and a male under the age of 16. We can fairly safely assume that the adult female was Hannah, his wife. 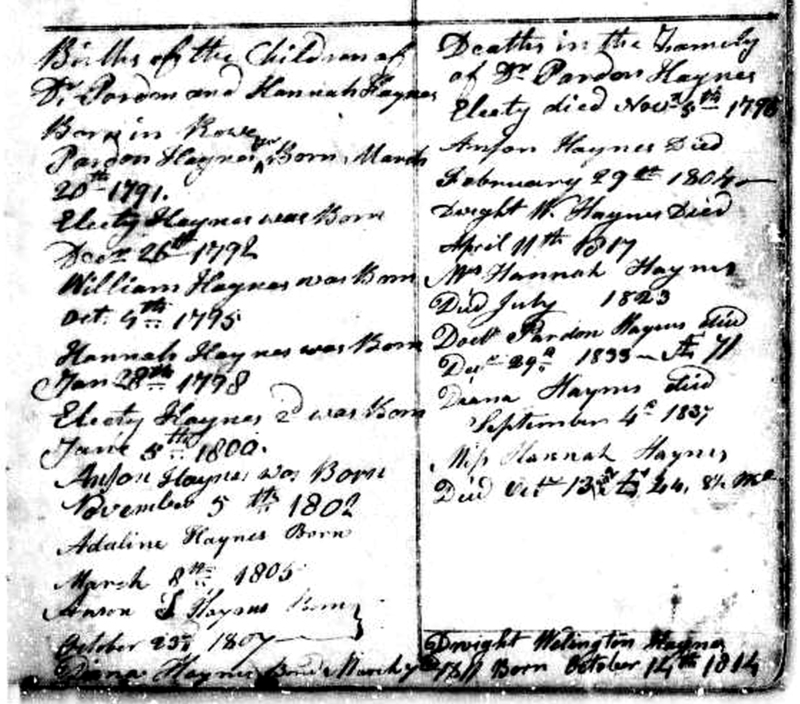 We don’t know who the male under 16 was since Dr. Haynes’ first child wasn’t born until 1791. It could have been a sibling or a hired hand but chances are we will never know. The record also gives us a clue about the size of the town of Rowe at the time. There was a total of 202 people enumerated in 1790, not a lot but more than a few. According to the Massachusetts Historic Commission report published in 1982 the “Rowe population grew by 61.6 percent between 1790 and 1830, peaking in 1820 at 851 persons. Much of this growth, amounting to 46 percent, occurred in the decade 1800-1810”. The economic base of the town at that time was “predominately agricultural with a small saw and grist mills established along Pelham Brook. A small tannery was established by 1800, followed by a fulling mill in 1808. During the War of 1812, Erastus and Moses Gleason enlarged the mill with the addition of 60 spindles for the manufacture of satinet”. One of the important textile manufactures of New England in the early industrial period was satinet, a satin-like fabric made largely from cotton. This shows that there was quite a bit of commerce happening all around Rowe at the time. The cotton was coming up from the south by horse and wagon since it would be a while before the railroad was built. Rowe was growing at a rapid pace beginning when Pardon Haynes built the house on Middletown Hill Rd. We have to believe he spent little time at home because he was riding from patient to patient. The more the population grew the busier he was. Meanwhile wife Hannah was at home with their growing brood. 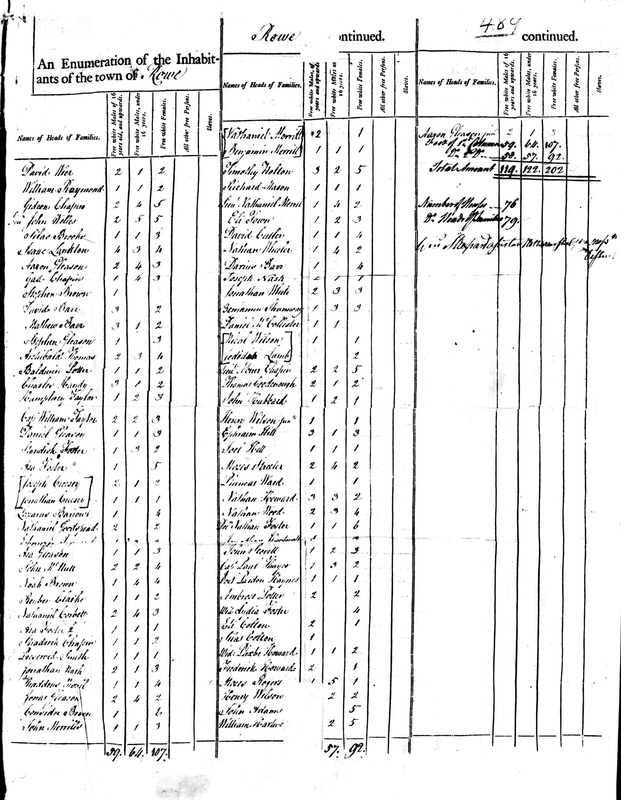 The Vital Records of Rowe show that they had 10 children from 1791 to 1814. This record is the handwritten vital statistics of Rowe. With just these two records we begin to get a small glimpse of what may have been happening in the house. Oral history has it that when Pardon and Hannah Haynes moved onto the land on Middletown Hill in 1790 they were living in what is now the ell. Dr. Haynes’s number of patients grew along with the members of his family. By 1800, when the big house was build they already had 4 children. Pardon Haynes also built an office for himself in one of the front rooms. The fine details in the woodwork tell us the importance of that particular room. With the house where it is located it was just down the hill from what was originally the town center where the first meeting house was erected in 1770. From other records we know that Pardon Haynes was actively involved in town politics, serving as selectman for a couple of years and was actively involved in the church. Next we will look into what life may have been like in the early 1800’s and what it’s like now trying to restore some of the property. ” Dr. Pardon Haynes.—This gentleman was born in New London, Conn., Feb. 2, 1762. When he was fifteen years old his father removed to Hoosac. During the Revolutionary war he served a short enlistment in the American army. He studied medicine with an elder brother, and commenced practice in Hebron, Washington Co., N. Y.; but, not feeling satisfied with his situation, he soon removed to the town of Rowe, Franklin Co., Mass. In that town he lived and practiced for a period of forty-five years, building up a most excellent reputation and accumulating a competence: He possessed a robust constitution, and had that quality of determination which invariably wins in the business of life. The region around Rowe was at the time he settled rough and wild, and his experience was in keeping with the condition of the country. His traveling was mostly on horseback, and his perils and escapes by night and by day were something wonderful to men of the present day. Sometimes, when the snows covered the earth to a great depth, he was compelled to make his visits on the Indian “raquette,” or snow-shoe, and the regular recompense was one New England shilling per mile. In those days bridges were scarce over the larger streams, and the doctor was often obliged to ford the Deerfield River on horseback at the imminent peril of his life and that of his horse. 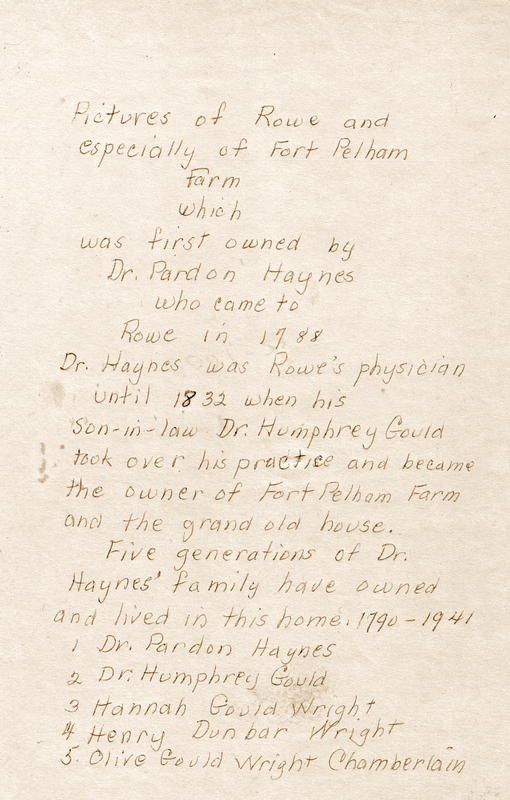 Other sources will tell you that Dr. Haynes became the physician in Rowe in 1790. Records show he was also a selectman in 1797 and 1809. Percy Brown writes in his history of Rowe, “Pardon Haynes, the old doctor, built the Wright house and the Frank Brown house south of it about 1800”. Both houses were built in the same style with Dr. Haynes home having finer details. 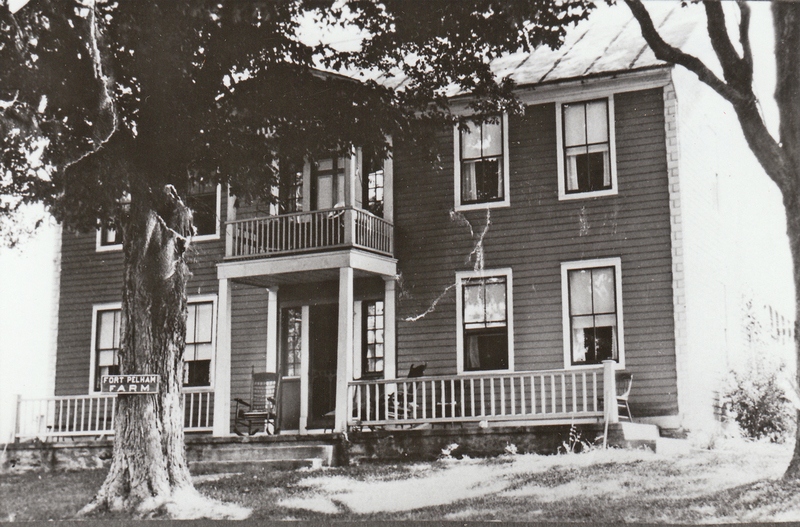 Olive Wright Chamberlain was the last descendant of Pardon Haynes to live at Fort Pelham farm which was sold out of the family in 1941. In a photo album that was returned to Rowe after her death she describes the lineage and you can tell how proud she was and how much she loved this property.